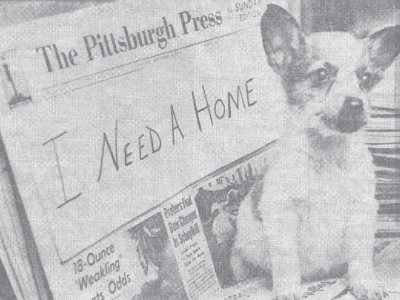 Today marks exactly 75 years since Animal Friends began serving the pets and people of the Pittsburgh region! In 1943, a small group of citizens made it their mission to find homes for soldiers’ pets when they left to serve in the war. Our founders took a name that clearly articulated their mission: to serve as friends to unwanted animals. And three quarters of a century later, it’s truly been an incredible journey. Starting in a rented out room in the bottom of the William Penn Hotel, our organization has grown into a bustling, 75-acre campus. 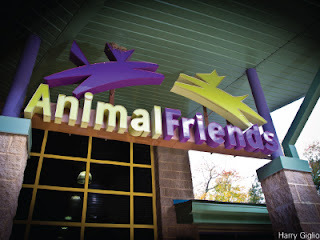 Although Animal Friends has accomplished feats in the last 75 years that were nothing short of incredible, we never realized that it would grow into such a visionary, progressive organization that is never satisfied with the status quo. 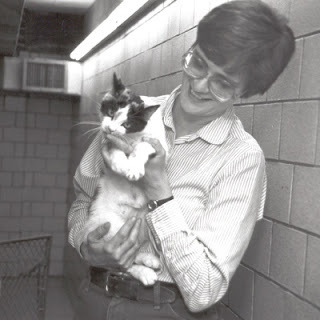 Before no-kill became a movement, our founders had a vision that no animal would ever be unnecessarily euthanized at Animal Friends. And, we remain committed to that premise to this day. We’re constantly striving to save the lives of more pets of our region. 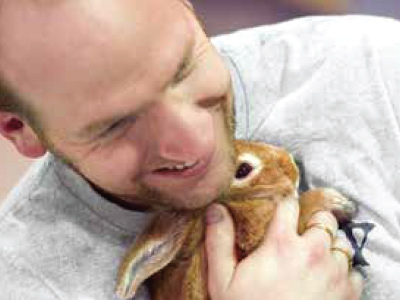 It’s not just the pets – it’s also about the people of our community. 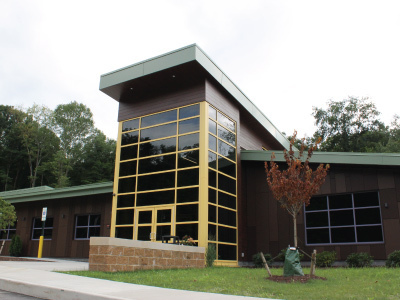 In 2006, we were able to better serve our region’s pet-owning families by opening the Caryl Gates Gluck Resource Center. And, this past summer we took that one step further by opening our Howard Ash Animal Wellness Center to ensure that all pet owners – regardless of income – can afford the critical wellness care that their pets need … and deserve. We are so proud that for 75 years we have remained committed to serving our animal friends and those who love them. But we simply cannot wait to see what the next 75 years (and beyond!) will bring. We'd love to hear your memories! So, as special birthday present to us, please share your favorite photos and stories from every decade of our 75 years on Facebook, Twitter and Instagram or send us an email. Before making her way to Animal Friends, a very pregnant Janis narrowly made it out of a small shelter in Kentucky. 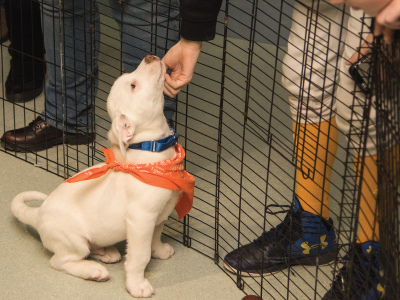 Because they were at capacity, they made temporary outdoor kennels for their resident dogs, including Janis. But just as quickly as the shelter had creatively made more space, a forthcoming winter storm was all it took to undo their hard work. And then, it went from bad to worse. 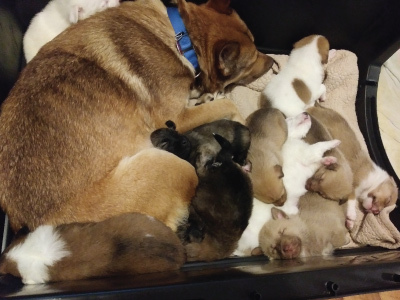 Janis had given birth … growing their problem 11-fold. They needed help – and fast. The shelter reached out to a rescue group in our region that transports animals in crisis to partner organizations. That organization then contacted us to see if we could take in Janis and her puppies. We, of course, agreed. And so, Janis with her 11 puppies in tow came to Animal Friends. They immediately went into a loving foster home. Janis was the perfect pet. Her foster family quickly decided that she would become a permanent member of theirs, once her puppies were ready to find homes. Lethargy set in. Janis wasn’t acting like herself. Then the vomiting started and a fever set in. It was mastitis, and she needed surgery. 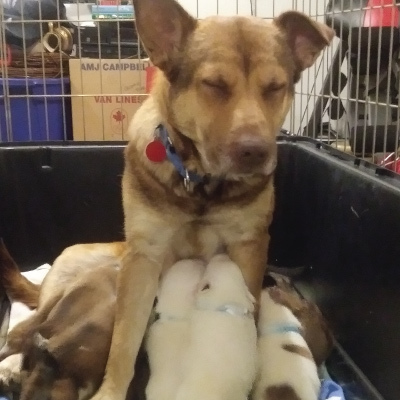 Despite her weariness, she continued to provide for her puppies. She simply wouldn’t give up on them. 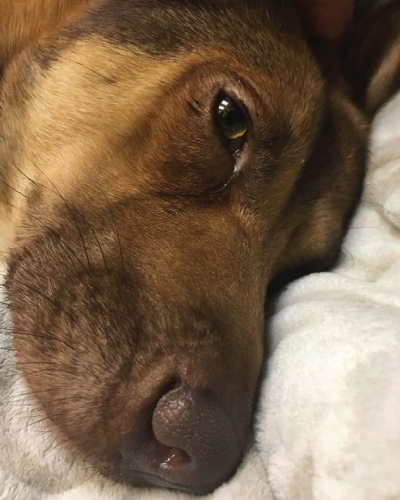 After her surgery, Janis stayed at Animal Friends to recover. She continued to decline. We would do anything to get Janis healthy … but we couldn’t even get her to stand, let alone eat. 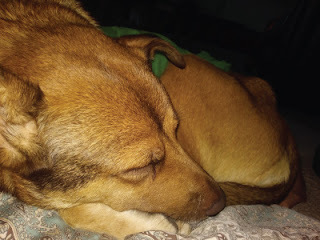 Then finally, we caught a break when her foster mom stopped by. Had we known what was about to transpire, well, we would have arranged it much sooner. 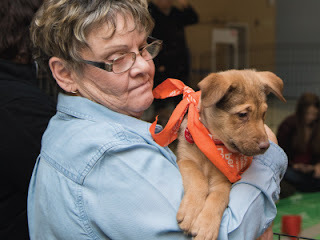 As soon as Janis spotted her foster mom, it was like her every ailment fell away. She rose from her bed and exuberantly went to her. In that moment, she was back to acting like the Janis we all knew and loved – even ate for the first time in days for her foster mom. Their bond was remarkable. Truly undeniable. We were hopeful that sending Janis home would speed up her recovery but the very next day proved otherwise. Janis couldn’t keep any food or medication down. Strictures were found in Janis’s throat that made even swallowing painful. So to give her esophagus time to heal, a feeding tube was placed. There wasn’t anything we weren’t willing to do for sweet Janis. As the weeks continued, there were good days and bad. Despite all Janis’s pain and misery, Janis remained devoted to her pups … just as her family remained devoted to her. We wouldn’t give up. We simply couldn’t. However, there are times when loving and letting go is the best thing you can do. Janis had pulled out her feeding tube. Her pain was too great. It was clear that there was no real chance for recovery. 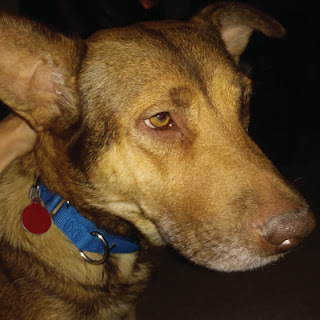 We were forced to make the heart-wrenching decision to say goodbye. Surrounded by those who loved her most, Janis was sent off with the utmost dignity, respect and compassion. She had finally found peace … and her home in the hearts of her foster family. There truly is a silver lining in every tragedy. In this case, it was Janis’s sacrifice to ensure her legacy of 11 puppies would go on to become beloved pets who will teach their families about companionship and love. But, you see, it was also the sacrifice of our staff and volunteers who made sure that Janis and her puppies received the best quality of care we could provide. At Animal Friends we have an unwavering commitment to give each and every one of our residents the individualized care they need – and deserve. 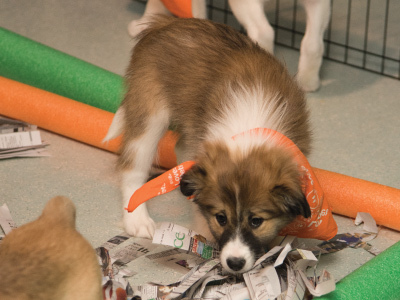 We’ll continue to work tirelessly for every animal who comes through our doors. We promise an unlimited number of hours and days – even years – of specialized attention. But we cannot continue without you. 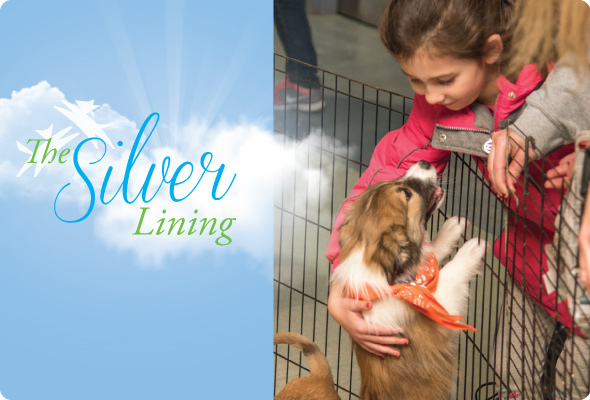 Help us continue to find the silver lining.